Juaquina Collazo, 84, of Pawtucket, passed away peacefully with her family by her side, on Friday, at the Hope Hospice Center in Providence after an illness. She was born in Juncos, Puerto Rico, a daughter of the late Isaac Mohica and Petrolina Collazo. She had been a factory worker prior to her illness. 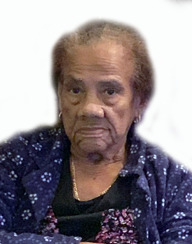 She is survived by her daughter, Leonor Hernandez of Pawtucket, six Grandchildren, Seventeen Great Grandchildren and 11 Great Great Grandchildren. Her Funeral will be held TUESDAY, April 16th from the Coelho Funeral Home, Central Falls. Visitation from 10 until 12:30 prior to her Funeral Service. Burial will be in Walnut HIll Cemetery, Armistice Boulevard, Pawtucket.